So I made it to the second Beer Club Belfast under new management. Myself and a mate jumped on the train and headed into Belfast and the Hudson. We actually cut it quite tight and made it though the door of the Hudson just at 8pm. I was actually surprised by the number of people in the room (and as Belfast Bar Man(ager) points out by the amount of facial hair! ), clearly good beer has a reasonable customer base in Belfast! Despite the 60 odd people in the room the atmosphere was informal, buzzy, and friendly. I'll also add warm, very fecking warm. Getting the coat off helped, but the beers certainly weren't there to cool us down! Each night at the club is themed, I missed the first night which covered IPAs (see an excellent review of that night by Stephen Barr on Belfast Beer Blog here). This night was Belgian Beers and a nice few surprises awaited us, including one new beer for me from "1001 Beers...". First up were the dubbles, Chimey Red and Rochefort 6 - both good beers but the Rochefort is the better of the two in my opinion. 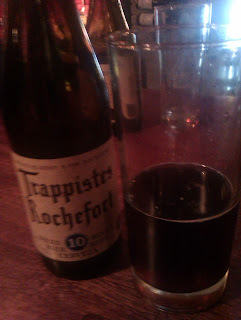 Next up was Rochefort 8 - a kinda super dubble or a mini quad depending on your point of view, another good beer with lots of complexity and warmth. Then came Westmalle Tripel which was described as a palate cleanser... a 9.5% palate cleaser... either way its an awesome beer. 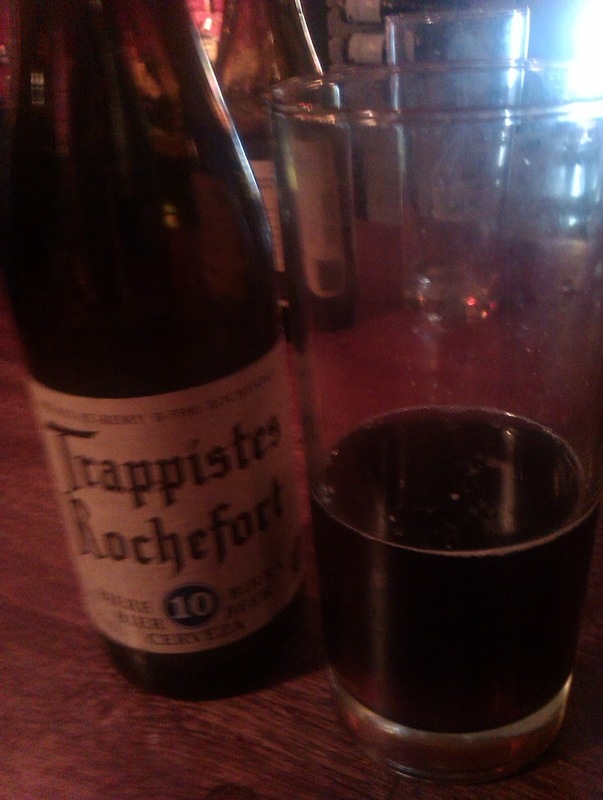 Finally came the quads, Rochefort 10 and St Bernadus Abt (which was my beer number 192 from the list). Both are really good beers that you should try if you see in your local offie. The 10 is darker, richer and more complex, while the Abt is slightly lighter and easier drunk. You could go either way on which is best - on the night a slightly prefered the Abt as it was slightly cleaner, but the Rochefort would be an excellent if you were just having the one. Some great beers right there, and a snip at a tenner if you ask me. The next one is on the 12th December at 8pm in the Hudson - and its porter and stout night! Two of my favourite beers (Bourbon County Stout and Brooklyn Chocolate Stout) are on the list for the night, so basically it would be rude not to attend. If your about get down there!